On the 70th anniversary of the Battle of Britain a board game commemorating the role of 303 Squadron (Polish) RAF has been launched. The 303 game is for two people. One player is the Royal Air Force defending Great Britain and the other is the German Luftwaffe. The aim of the Luftwaffe is to bomb London and the goal of the Royal Air Force is to stop them. The board resembles the table of command used at the headquarters of the RAF during the 2nd World War. The game has been designed by Dr Tomasz Ginter and Karol Madaj from the Institute of National Remembrance's Public Education Office in Warsaw. It is available in three languages: English, Polish and Czech. This reflects the contribution made by Polish and Czech pilots during the Battle of Britain. "The 2,300 RAF pilots were reinforced by 574 pilots from other countries, notably Poland and Czechoslovakia. In fact the Poles provided the largest foreign contingent and its famous 303 Squadron was the top scoring squadron. A Czech, Josef Frantisek, was the top-scoring fighter ace." An exhibition commemorating the role of Polish and Czech pilots in the Battle of Britain was opened at the European Parliament in Brussels, on 28 September 2010, by Jerzy Buzek the President of the Parliament. The President also took the opportunity to play the 303 board game which had its European premiere at the exhibition. The event also had photos and films and a scale model of a Hawker Hurricane aircraft. The Polish premiere of the 303 game takes place at 3pm on 6th October, 2010, at the Institute of National Remembrance’s Educational Center, 21/25 Marszalkowska Street, Warsaw. An illustrated set of instructions ( PDF file) on how to play the game can be downloaded. The document also contains profiles of three of the pliots who took part in the Battle of Britain. The instructions, in addition, contain information about some of the aircraft which took part in the Battle of Britain. The game is available from the Royal Air Force Museum shop [May now be out of stock - September 2013]. 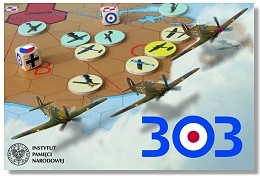 303 Battle of Britain Board Game, Institute of National Remembrance, Warsaw. 303 Board Game Instructions (PDF file). This page was added on 03 October 2010. Updated on 28 September 2016.